The Adult Choir sings approximately three times a month in services. We rehearse every Tuesday evening from 7:30-9pm at Sacred Heart Church across the street from Follen. On the Sundays we sing, we typically arrive for a rehearsal at 9am to sing in the 10:30am service, with time for coffee, snacks, and social time in between. This is an un-auditioned group of volunteers with approximately 25 regular members. We are supported by four professional section leaders and a collaborative pianist. 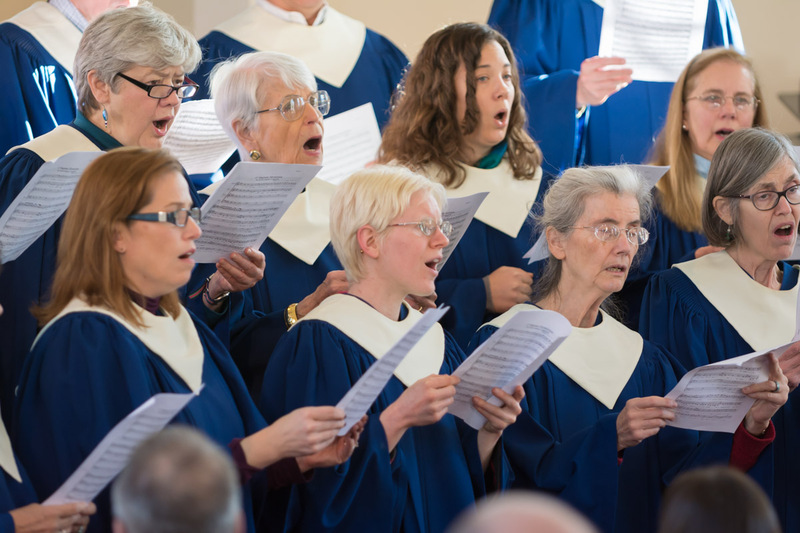 Our repertoire spans the choral spectrum including music of Unitarian Universalist composers, masterworks, multicultural music, and folk music. We typically sing SATB music, oftentimes with divisi. The Adult Choir stages two Music Sundays each year, oftentimes with a chamber orchestra. Such Sundays have recently included Bernstein’s Chichester Psalms, the Bach Magnificat and the St. Matthew Passion, Handel’s Messiah, Mozart’s Mass in C minor and his Requiem, Dvorak’s Mass in D, and Britten’s Ceremony of Carols. Interested in joining? For more information, email musicdirector@follen.org or call 781-862-3805. See the schedule for the 2018-19 season.